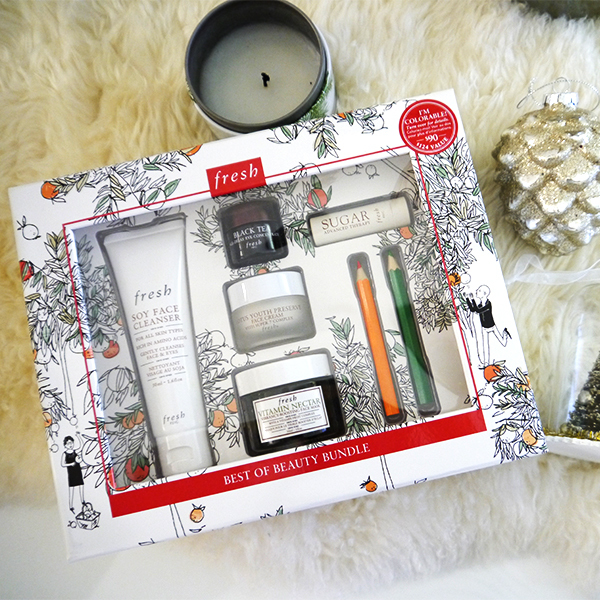 Last Minute Gift Ideas From Fresh Beauty & Rocky Mountain Soap Co. It's now officially five days until Christmas, and no matter how organized I try to be every year I always find myself running errands in the final week. If you are one of those people with decorations in place, presents wrapped, and cookies baked who is now smugly sipping cocoa listening to Christmas music: Tell me your secrets!! 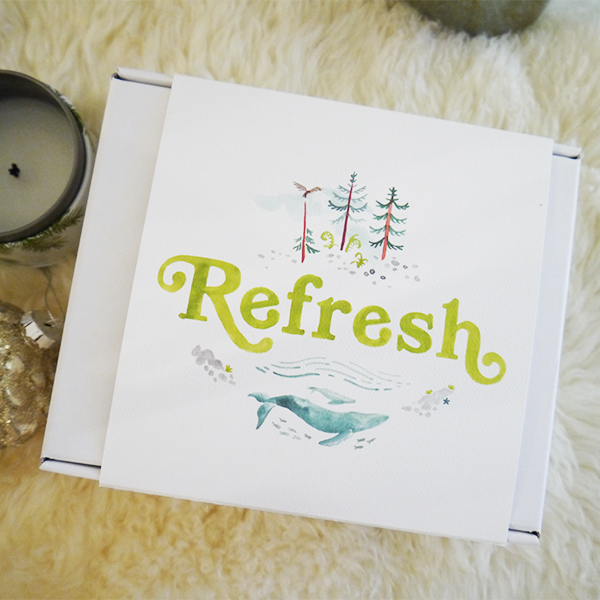 Anyway, whether you've checked off everything on your list and you're rewarding yourself for a job well done, or you're still looking for a few last-minute gifts, look no further than these beautiful boxed gift sets from Fresh and Rocky Mountain Soap Company. The boxes are so lovely, in fact, you might be tempted to leave them unwrapped if you're really pressed for time! 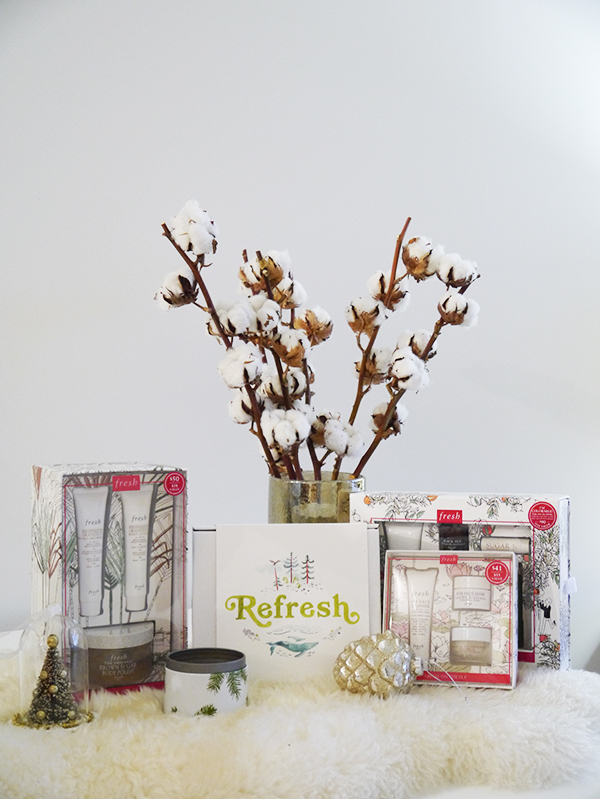 The first two things you'll notice about the Refresh Gift Set are the "Refresh" illustration on the front and the invigorating aroma of all-natural lemongrass before you even open the box. If I were the recipient, I'd be tempted to save the watercolour illustration to pin up at my desk. The Lemongrass Hand & Body Wash lathers well without the use of sulfates, while glycerin and jojoba and coconut oils gently cleanse and nourish. It works well as a hand soap by the kitchen sink or as a body wash—just think how invigorating the lemongrass scent would be in the shower first thing in the AM! I have yet to try any of Rocky Mountain's bath bombs, including the Lemongrass Bath Bomb, but I'm already excited at the prospect because of the skin-softening coconut oil and cocoa butter it contains. Same goes for Aloe There Soap, which is supposed to be really soothing and hydrating on winter-dry elbows, knees, and legs. I've used Lemongrass Body Butter before (previously featured here) and adore it. Pretty stoked to be restocked! Fresh Soy Face Cleanser (previously featured here and here) is a Fresh cult fave for good reason. The delicious cucumber fragrance and cooling gel texture combine for a spa-like cleansing experience that delights the senses. I currently have a travel-size tube of this in my gym kit and always look forward to washing my sweaty face with it post-barre class. Fresh Lotus Youth Preserve Face Cream (previously featured here and here) is a great all-around face cream suitable for all skin types. Fresh Rose Face Mask (previously featured here) features real rose petals, soothing rosewater, and a hydrating and cooling gel texture. For an extra touch, the set comes with green and orange pencil crayons so you can colour the black-and-white line illustration on the box (all the better to promote holiday mindfulness). Finally, remember what I said at the beginning of the post about how if you're in a hurry you don't even have to wrap these? 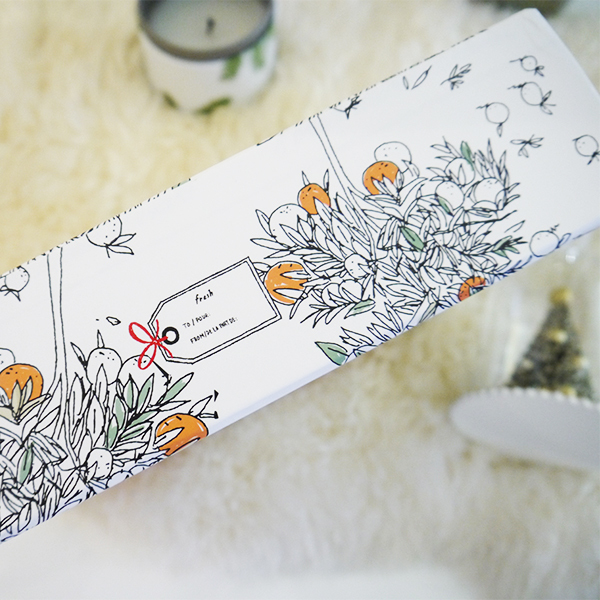 Each of the Fresh gift sets comes with the gift tag printed right on the box. Genius. For more beauty gift ideas, check out this post, this post, this post, this post, and this post.